The gothic style peppersauce was probably first designed in the 1840's and became very popular with retailers until the 1880's. It was produced in numerous glass houses in the East and Midwest. As would be expected, stylistic variations are abundant, but the gothic arch panel is usually the mainstay feature. 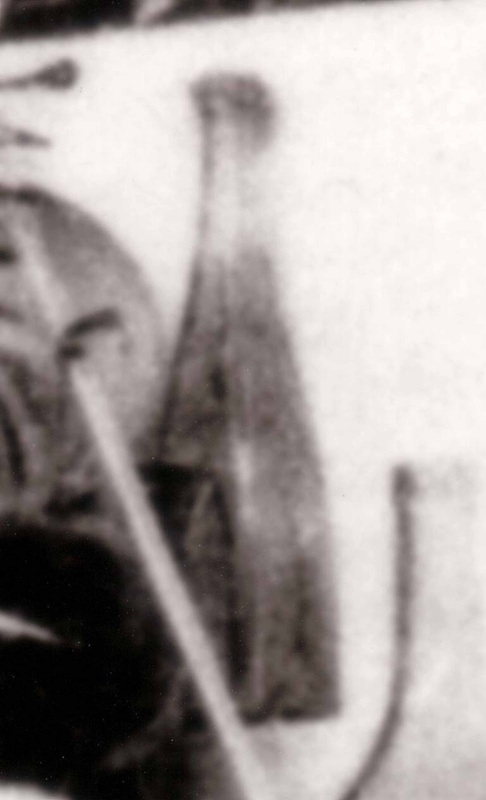 The style was so popular that it was even produced by the early San Francisco glass factories. This little California jewel is, in my opinion, somewhat under-appreciated by collectors. So far, the earliest documentation of this bottle that I have been able to find is the 1869 Pacific Glass Works display at the Mechanic's Institute Exhibition, when it was photographed along with many of the company's wares. Having studied these bottles for many years I have noticed several unique features that I would like to share and also, perhaps elicit comments and observations from others who may have found these bottles interesting. I am sure there are outstanding examples residing in western collections. My first observation is that there was only one pattern used in their manufacture in San Francisco, and it is unlike any other design. In other words it is only found in the western states. While it may be similar in design to some of those used in the East, it is distinct in form. To think that none of these bottles were ever shipped east is quite unlikely, however, they are so common in the west that it is only logical to assume they were produced in the west. At first glance the pattern appears to be like many others that are also found throughout the United States. The most significant unusual feature is the simplicity of the top two sunken panels. All non-western versions have slightly more embellishment in this area. The remainder of the pattern is virtually identical to many of the eastern/mid-western counterparts. 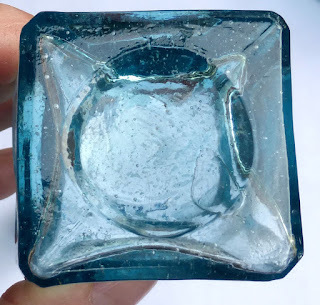 To complicate matters just a little, the western design is also found in two distinct molds, and with a corresponding distinct lipping tool used with each of the molds. Both are shown above. It is probably impossible to determine if the molds were used simultaneously, either by the two major factories during the time, or at the same time by the same factory. With this in mind I will venture to predict that the earliest mold, which I will call Mold One, pictured above on the right, is probably the same mold that produced the bottle in the 1869 Pacific Glass Works photo. The design of the side panels are nearly impossible to differentiate between the two molds, however, Mold One has a unique base design and lip finish. Mold Two is on the left. The base of Mold One is characterized by an edge frame that is not present in Mold Two. The central dome on the base is formed to create a true "key" type mold, with the dome attached to one side of the bottom, which forces the two mold halves to tightly align when the mold is closed. Another unique characteristic of Mold One is located on the base on the upper left of the above photo. This part of the mold seam is extra heavy and this feature is found on all of these bottles that I have examined. Mold Two, above, has its own unique characteristics and was likely used over a greater period of time as the bottles are found with tooled tops and in contexts that date to about 1890. Perhaps the greatest difference between it and Mold One is that the base configuration is missing its surrounding "border" and the central dome is a separate post piece, usually referred to as a post mold. There are no unique or outstanding mold line "fingerprints" on the base that could otherwise identify it. As noted earlier, the lips of each mold are consistently made with slightly different tool configurations. Keeping in mind that the lipping process can produce somewhat inconsistent variations, a study of the lip profiles reveals slightly different yet identifiable features. The lipping tool for Mold One, on the right, reveals a rather sharp edged skirt while the very top profile is more full and rounded. The lipping tool for Mold Two, on the left, creates a more rounded skirt profile and the topmost bulb is flatter across the top. The last of the notable differences are contained within slight inconsistencies along mold seams. Much like fingerprints, these differences are unique to specific molds. The seams along Mold One are clean and show no unique features except for one on the base, as noted above. Mold Two also produces fairly clean seam marks on its bottles except for one feature on the shoulder and located just to the left of the red marks on the above photo. 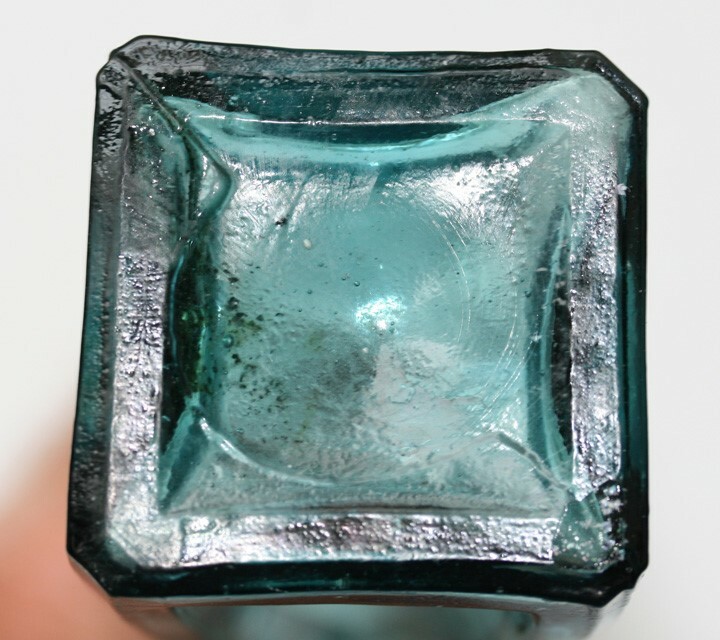 Although small, and difficult to photograph, this bump or protrusion of glass is typical of all bottles blown in Mold Two. 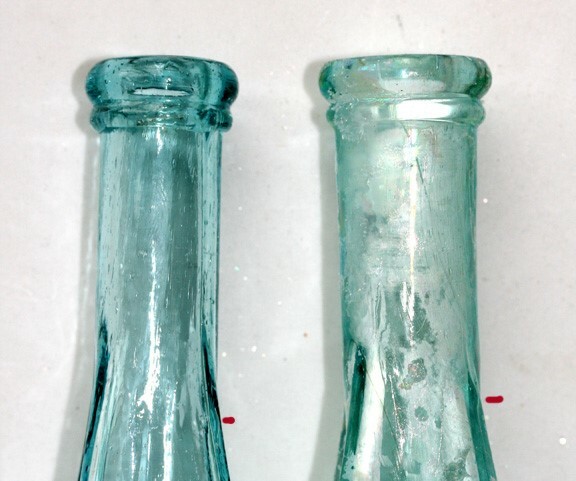 The photograph above also shows the last of the bottles blown in Mold Two (on right). 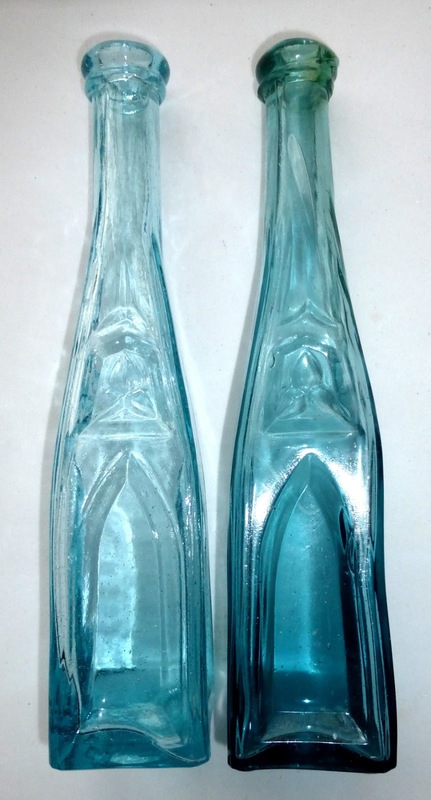 By the 1880's the vibrance of our aqua western glass began to look like nearly every other glass works product. As in the tooled top example of the Mold Two peppersauce, probably made in the mid to late 1880's, the telltale signature of the small bump on the shoulder still survives. However, a most obvious variation to Mold Two is the enlargement of the neck, which likely allowed for some relief to the age-old problem of the contents becoming stuck in the bottle. The neck portion of the mold was increased 3/16 inch which allowed for easier pouring. With the described revealing features, along with the usual but less consistent visual substance of western glass qualities, it is quite easy to identify these bottles. 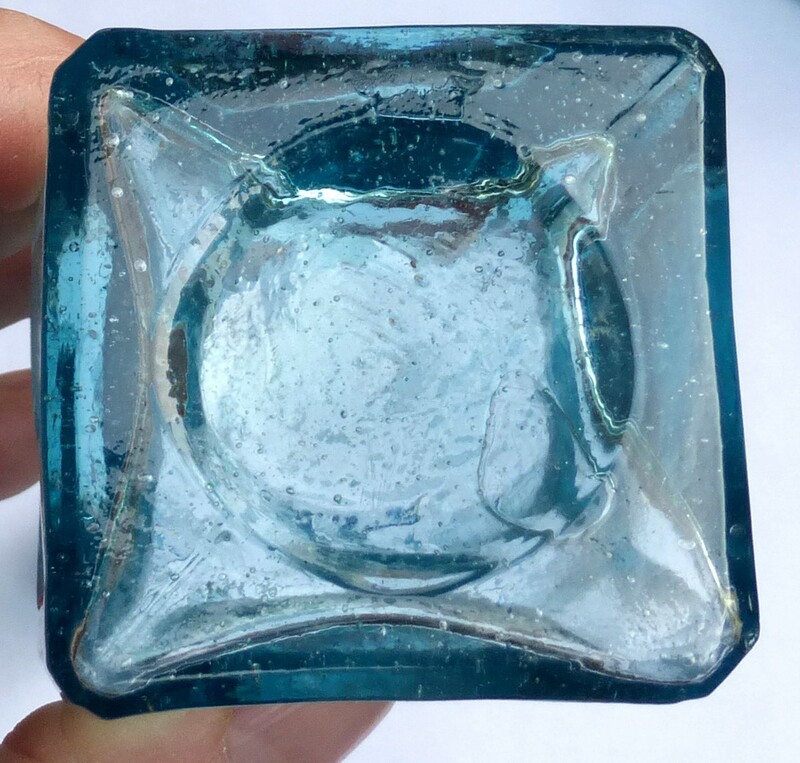 The colors are the usual range of aqua found in western glass, even with an exceptional western citron example sometimes blown in Mold One. These bottles are certainly overlooked. How many have you seen in yellow or green ? I have not seen one in green. I have seen one in a bright citron loaded with bubbles. It came in the door of the Northwestern Bottle Collectors show and sale in the 1960's at the El Rancho Hotel in Santa Rosa, CA. It was supposedly dug with about 20 others in Napa, CA, and was the only one with that color. It sold for $90 which was a huge amount back then. I would venture to say it could easily bring $3500 on today's market. I have no idea who owns it now. Awesome article, Thanks for sharing. The 1st bottle I ever dug was a Pepper Sauce Bottle, I have Family from SW Louisiana (Go Saints) where the Peppers are Grown. I have maintained a collection of food type bottles since I started digging and still have many. Great Read. Does anyone have any photos of a yellow western example ?